The Baggage Handler as depicted in GTA Vice City (Rear quarter view). The Baggage Handler is a small airport tug featured in Grand Theft Auto: Vice City, Grand Theft Auto: San Andreas, Grand Theft Auto: Vice City Stories and Grand Theft Auto: Chinatown Wars, used to transport luggage to and from aircraft. The vehicle is simply known in GTA San Andreas as the Baggage. The Baggage Handler is designed as an open air, electrically powered vehicle predominantly used to pull loads in airports. Due to its function, the vehicle barely offers any luxuries; the vehicle does feature a small cargo compartment in the rear, which may occasionally contain cases, toolboxes or earmuffs. 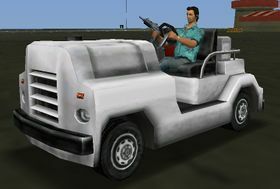 For all of its appearance, the vehicle comes in white, with the exception of GTA San Andreas (where is it only in light gray); the GTA Vice City Stories rendition additionally includes Baggage Handlers in light gray or dark gray alongside white ones. The GTA Chinatown Wars rendition receives a longer frontal engine compartment in order to scale the vehicle better to gameplay. Regardless, when driven, the driver appears oversized due to a minuscule driver compartment. In the PSP version, the Baggage Handler is surgical green, whereas in the DS version, it is white. In GTA San Andreas, it is possible to use the Baggage Handler to tow luggage carts and a boarding staircase found in airports. The game considers these attachments as vehicles so they can be damaged, catch on fire, and explode. PIGs in GTA Vice City can also be seen driving Baggage Handlers as their "gang car". A Baggage Handler in GTA Vice City (Rear quarter view). A "Baggage" in GTA San Andreas (Rear quarter view). A dark gray Baggage Handler in GTA Vice City Stories (Rear quarter view, light gray color). A Baggage Handler in GTA Chinatown Wars. The Baggage Handler's slow speed, weak construction, and poor handling make driving one of these on a heavily traveled, high-speed thoroughfare extremely treacherous. Furthermore, the Baggage Handler is highly susceptible to damage from weapons, to the point where close range shotgun blasts can physically move the vehicle. While nothing much has changed in the GTA Chinatown Wars rendition of the Baggage Handler, speed and handling have been tweaked slightly. The Baggage Handler plays K-JAH West by default when entered in GTA San Andreas. In GTA Vice City, if you listen closely, the Baggage Handler makes the same engine sound as the Burrito, Top Fun, and Greenwood. This page was last modified on 4 January 2015, at 08:26.